What’s your favorite way to lean back, to relax while watching television, to listen to music, to play video games, or to meditate? Mine is to lie on the floor of my office, reclining with two pillows I stole from our couch, fully relaxed. But now I have an even better way, using the HUMU Smart Cushion. The Flexound HUMU (Human Music) Smart Cushion is a plump, wedge-shaped pillow that measures ~20″ long by 11.5″ wide by 5.5″ deep. It is covered in faux suede, and it has a convenient handle on one end. It’s made for sticking in the most comfortable position so you can either sit or lie while consuming media. But that’s not all. HUMU is a word meaning ”humming” or ”commotion” in Finnish, the native language of Finland. The name HUMU is also making reference to “human music”. The HUMU Smart Cushion has built-in speakers and a vibrating apparatus which allow you to not only hear sound but to feel it as well. The HUMU, which was first introduced to us as a successful Indiegogo product, is a near-field speaker experience, which means that it is sound that the user can enjoy without disturbing others in the same room. HUMU utilises exclusive patented Flexound® Xperience technology. Designed and engineered in Finland. Included in the package are the HUMU Smart Cushion, a microUSB charging cable, a user guide in English and a user guide in Chinese. 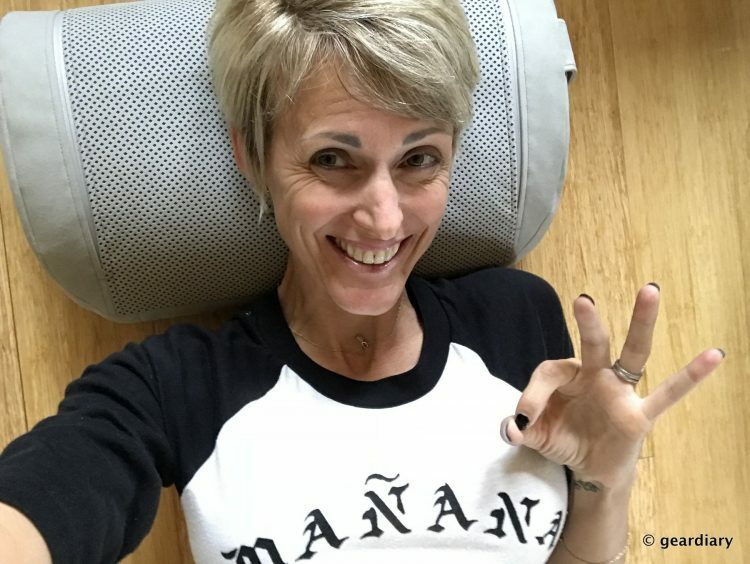 The pillow is soft, yet firm; it offers support for your head when leaning back(you can flip it so the wedge is under your head, or so that your head is resting on the highest part — whichever feels better), or it can be placed in your lower back while sitting in a chair (extra points for the impromptu massage). With Flexound HUMU you can immerse yourself in your favorite content simultaneously hearing and feeling the sound waves. Flexound HUMU creates an ambient soundscape in which you can enjoy with multiple senses in unison. You can hear the sounds, you can feel the sound waves and immerse into it. Imagine hugging your favorite song, feeling the voice of your loved ones or adding new excitement to your gaming or virtual reality products. Music works like a miracle medicine: it has a hugely positive influence on our brains. When you listen to music the amount of the pleasure hormone dopamine starts to increase in your blood, while the amount of stress hormones is reducing. The impact is further enhanced with the feelness and vibration of the sound waves that only Flexound HUMU can offer. The feelings are definitely ON! 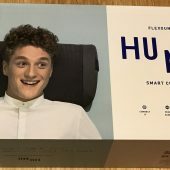 The HUMU Smart Cushion reproduces sounds and vibrations in the range of 20hz to 20khz; the company says that the battery will last for up to 8 hours playtime (which I have found that to be true), and it takes about three hours to fully charge from empty. The faux suede material is comfortable and it doesn’t get hot under your head or back. Instead of loudspeakers that vibrate sound into air, HUMU vibrates sound through an Elastic Vibrating Element, through foam, and into your body, providing a unique listening experience. On one end, there is a built-in handle. On the other, there is a pocket that is held shut with a magnet. 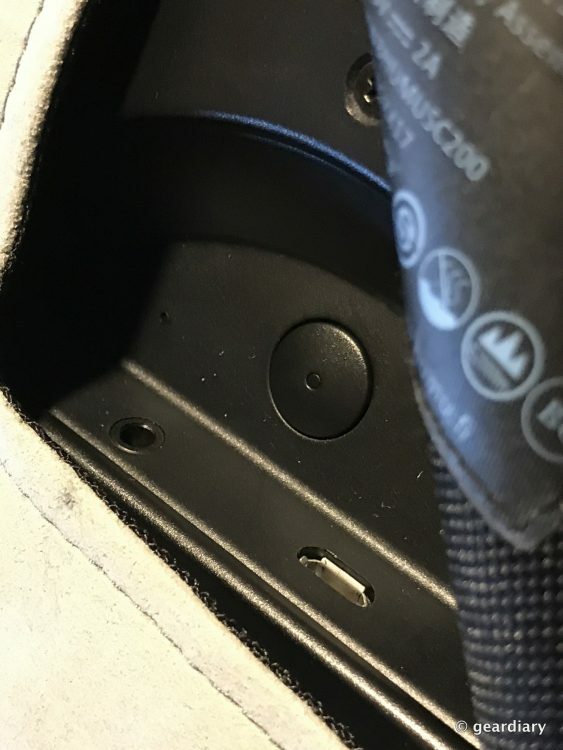 Inside the pocket, there is a microUSB charging port, and an AUX in port. 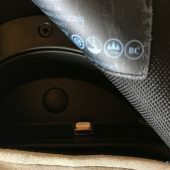 The large button is for turning the HUMU Smart Cushion on or off; it’s hard to see, but on the left of the power button there is charging LED that will glow orange until it shuts off once the battery is full. On the right, there is a white LED that glows when the HUMU is powered on. It’s all very simple; there are no volume buttons, as that is controlled by the device you are streaming from. The only complaint I have about the pillow’s hardware is that the microUSB slot is tricky to insert the cable into; it’s a very tight spot. I solved this issue by cheating. 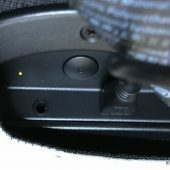 Remember the magnetic charging tips I reviewed earlier this year? Well, they are fantastic in this use. 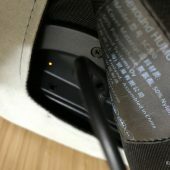 I just connect the magnetic tip (attached to the charging cable) to the plug that stays in the microUSB port, and there are no issues fitting the cable into the tight spot to get a proper charge. Once the pillow has fully charged, you press the power button for about 3 seconds until there is a vibration with a tone. The white LED will blink, signifying that the HUMU is turned on, and the pillow will be ready to pair. You can pair the pillow to multiple devices at the same time (I have it paired to my iPad, iPhone, and laptop right now), but you can only be connected to one device at a time. Pairing to a second device is accomplished by pressing and holding the Power button as you turn it on; a blue light will flash in the middle of the power button indicating that it is ready to pair. You turn the pillow off by pressing and holding the power button again for about 3 seconds until there is a tone and the pillow vibrates again; the white LED will extinguish, verifying that the pillow is turned off. So what’s it like to use the pillow? It’s like nothing I’ve ever experienced, actually. In fact, I’m still discovering ways to use it! 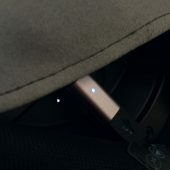 The feelsound technology used in HUMU, combines high-quality sound reproduction and physical distributed vibration, that allows users to hear and feel sound simultaneously. Unlike loudspeakers that vibrate sound into air, HUMU contains our proprietary Flexound Xperience module and a patented EVE (Elastic Vibrating Element) to vibrate sound into an intelligent foam interior. This produces a soft, near-field listening experience which minimizes disturbance to others in vicinity of the device, even when listening to bass-heavy frequencies. When I’m working, the HUMU fits very well in the hollow of my back — forcing me into proper posture (always a very good thing). 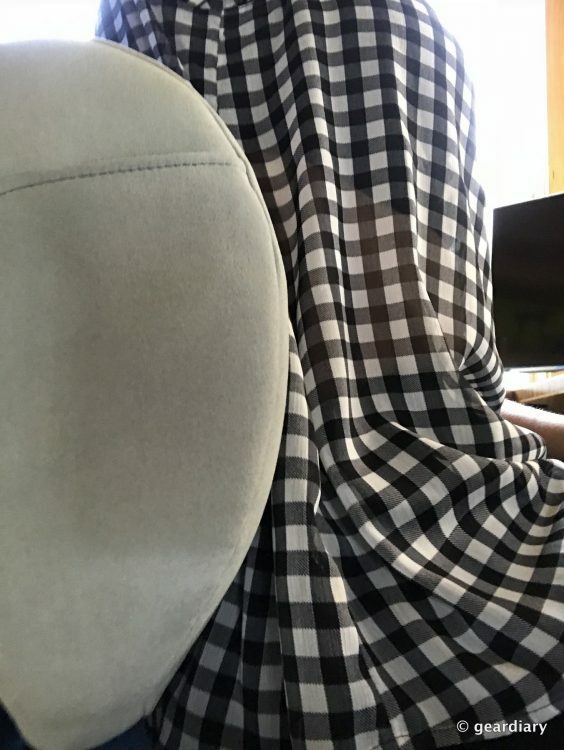 As I sit here writing now, it’s tucked between my chair and my back playing music loud enough for me to hear (with the volume at 75% on my iPhone), I am getting a back massage, and it is physically impossible for me to slouch. The music doesn’t fill the room — it is loud enough for me to hear, but it’s not really projecting anywhere but up to my ears while my back enjoys the vibrations produced by the sounds. HUMU creates an ambient sound sphere which you can enjoy with multiple senses in unison. You can hear the music, you can feel the music and immerse into it. 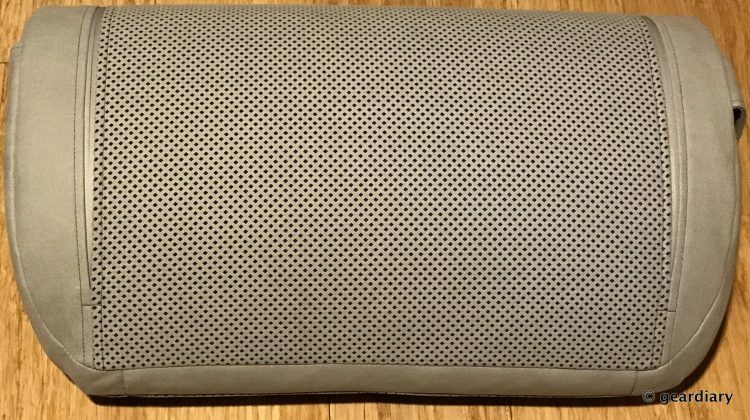 My favorite use for the HUMU Smart Cushion is when I’m lying on my office floor listening to music, meditating, or watching videos. I have a 2017 TCL smart television, but it doesn’t have Bluetooth (can you imagine, in this day and age?). 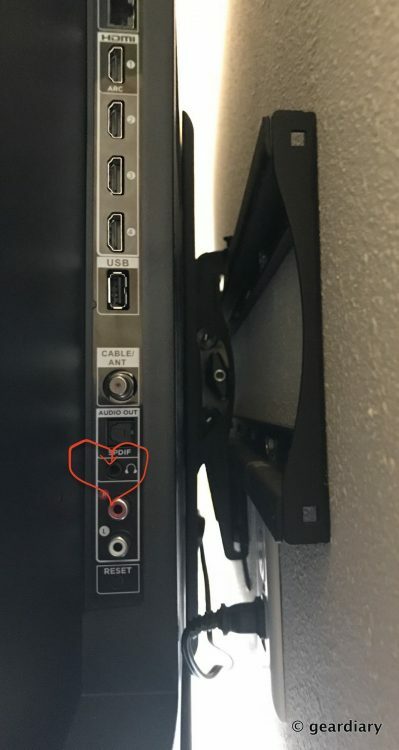 It does, however, have a headphones/AUX out port. SCORE. I have purchased a 15′ auxiliary cable, which is more than enough to reach my favored position on the floor. Let me tell you why the HUMU is so awesome for watching television. My office is noisier than I’d like because I have a portable air conditioner running almost all of the time. I don’t have a speaker connected to my television, so I have to turn the volume up to 90 or I have to put the subtitles on. Lying on the floor watching television with the HUMU means that I don’t have to crank the volume and fill my office with yet more noise; I can hear everything perfectly through the HUMU Smart Speaker, and I get the same cool rumble effect that I experience when I’ve paid for a ticket at an Icon Cinema for their VIB (vibration sensation) seating. Watching television is now not just an auditory and visual experience — I actually feel every explosion or footstep; it’s so cool and immersive! I’m no gamer, but I’m positive that this would make for an amazing experience! HUMU covers the whole frequency range from 20Hz to 20kHz with a single element, while the vibrating sensations are felt most at lower frequencies. Middle and high frequencies create a unique soundscape, that we call the HUMU sound island or sound bubble. 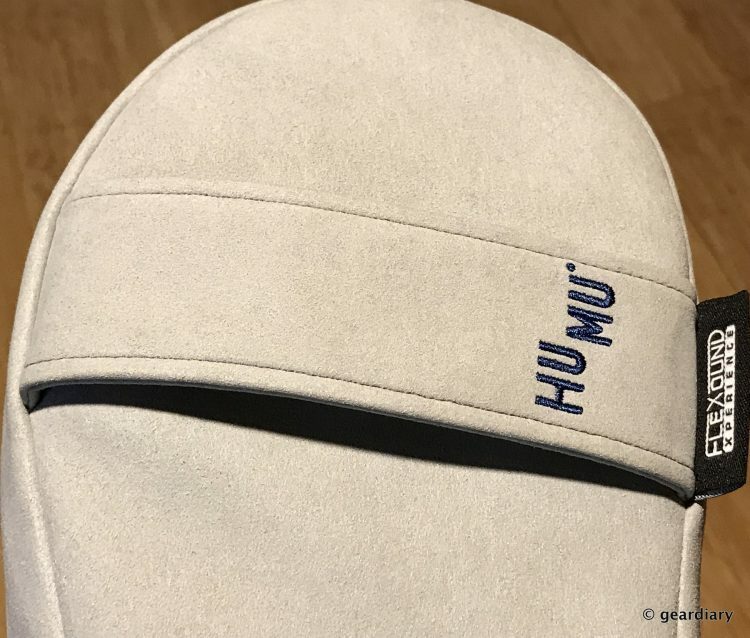 I also like to lie on the floor while meditating, and rather than running my Spotify Meditation playlist through the Amazon Echo in my office as I used to, I now just use the HUMU pillow. The result is an immersive and yet relaxing experience; I feel the raindrops or chimes as they happen; the sounds are in my ears and I feel them down my back. It’s a whole new level of relaxation. Me after a long day — best relaxation spot in the house! 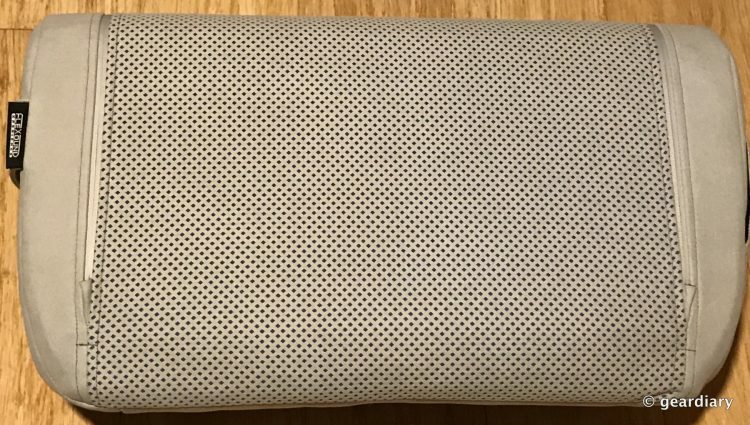 The HUMU Smart Cushion can function as a standalone speaker, even though that’s not necessarily its intended use: it’s also been sitting on the side of my desk playing music as I wrote much of this. The reason it is loud enough to fill my office with music is that I’ve got my iPhone’s volume cranked up to about 75%, and there are no parts of my body blocking the speaker. It’s a bit large for this use unless you have a big desk, and it’s not as quite as booming as another portable speaker might be, but it works just fine in this capacity. It does vibrate the desk a bit, but it’s not annoying. Sound through the HUMU Smart Cushion is very good — the bass doesn’t bottom out, mids are clear, and highs are pure. It is excellent for spoken word, music, and huge explosions. In other words, it is a great all around speaker with a special trick: it allows you to hear and feel the music. It can be incredibly relaxing, or it can be thrilling — it just depends on what you are listening to and what that sound is doing. Flexound’s story began as a request from the wife of Jukka Linjama, PhD in acoustics, a violinist and inventor to-be. Desiring to create a device to assist his wife, an occupational therapist working with disabled and autistic children, Jukka set forth to invent what would become the Taikofon FeelSound Player, Flexound’s first product intended for therapeutic use. If you have been looking for a way to make your listening and watching experience even more immersive, the HUMU Smart Cushion will do that for you. 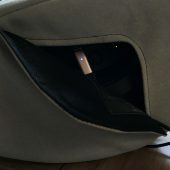 Whether you are in a chair, on the couch, or lying on the floor, HUMU makes it possible to feel your music as well as hear it — without disturbing anyone else and without cutting you off from anyone else that enters the room, but most of all, it does it in a way that is immensely enjoyable for you. 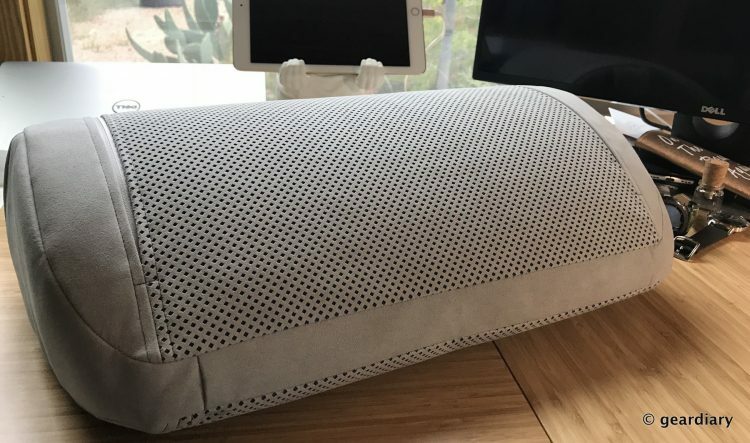 The HUMU Smart Cushion is now the only pillow in my office; I wish that they made a travel-sized neck pillow because I’d want one. 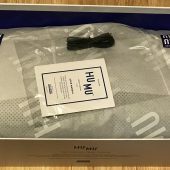 The HUMU Smart Cushion retails for $299; in the USA it is available in graphite or gray from B8ta and from their Indiegogo page. If you live in the UK, Germany, or France, you can get it from Amazon UK. 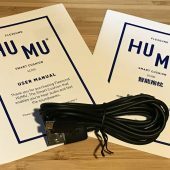 You can read the HUMU user manual here.